The best way for your corporation or organization to be successful is to have a great team. Building that team is not easy. In addition to finding people with the skills needed to do the job, and putting them in a position where they can maximize their potential, chemistry is very important. Chemistry and team building can also be difficult to create if you only pay lip service to it. That’s why team building is so important. According to Forbes, “it builds trust, mitigates conflict, encourages communication, and increases collaboration.” That translates into a well oiled machine which is essential for your workplace. NY Party Works has been planning corporate events for more than 30 years and we know what it takes to put together a successful team. 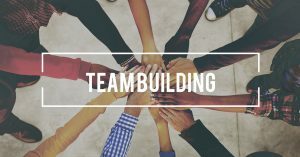 So we want to let you know about some team building and ice breaking activities that can help strengthen your organization and bottom line. Video games are great for a team building event. Adults will gravitate towards these games to work with or compete against with their piers or their boss. The Giant Pac Man Battle Royale is one of the most popular games for adults. Up to 4 players can play at once. The Giant Speed of Light and sit down driving games such as the super bike or Super Cars will be a great way to get employees to be involved with each other with some friendly competition. Pinball machines can also be set up. There are many old classics available that will bring a nostalgic feel into an event. What could be a better ice breaker than the game you played as a kid in your basement or in a community game room? NY Party Works has two ways you can turn foosball into a team building activity. We offer Human Foosball, in which teams of ten players try to kick a soccer ball into a goal while connected to a long metal poll. Teamwork and communication are essential. For winter months when space might be limited, we recommend our 16 player LED Foosball Table. Your team will have to be ready for anything with non-stop play and four balls in action. One quality that often leads to business success is to be able to push the limits of what you’ve done before. Our 25-foot Rock Wall will provide your team with the ultimate challenge. It can accommodate four people at a time and can promote fun or serious competition. You can have individuals or teams compete against each other and you can discuss your triumphs and difficulties after its over. Golf is another great ice breaker that mixes fun with competition. NY party Works’ nine hole Mini Golf courses will bring enjoyment to your employees and will allow them to interact in a more relaxed atmosphere outside of the office. You can play a leisurely game or have a competition, either way you’ll have a blast. For a more upscale challenge, try NY Party Works 4 player Putting Challenge. It has 18 holes to choose from with two different skill levels. Zip lining is a popular team building activity that allows your employees to go outside their comfort zone while getting an adrenaline rush. Renting a zip line from NY Party Works requires an outdoor setup, but it’s a great way to have an adventure. Your group will travel at speeds of up to 21 mph, but our spring-based system allows for one of the safest landings you can find. If you’re looking to strengthen your corporation or organization’s team, NY Party Works has the expertise to help. We’re a full fledged party and event planning company and we know how to help our customers achieve their goals. We can help you find a team building event that works for you. Contact New York Party Works today. « Winter Sweet 16, Quinceanera or Bar/Bat Mitzvah? Let Us Help!